Al Jazeera America reveals massive GOP voter suppression effort: Millions of minorities are being purged from voter rolls ahead of midterm elections. New revelations show GOP officials in key battleground states are attempting to purge millions of minorities from the voter rolls. 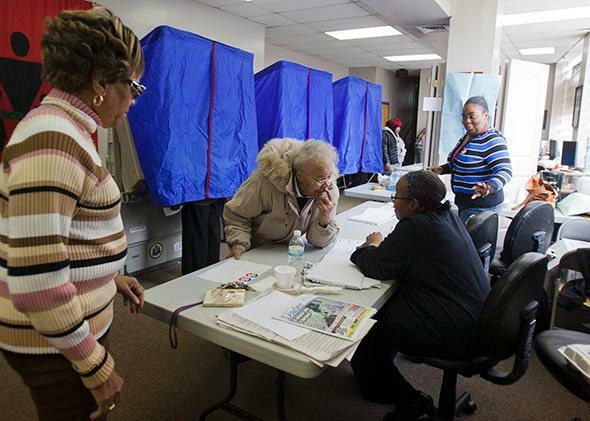 A voter signs in at her polling place inside the Concerned Black Men’s office in November 2012 in North Philadelphia. Fair enough. That’s a reasonable sentiment. Despite substantial evidence to the contrary, Republicans and other voter ID supporters don’t want to make it harder for more vulnerable voters to cast a ballot—although that’s the practical outcome of an ID requirement—they just want to secure the process and protect the integrity of the vote. But this doesn’t explain the Republican-led push to end or limit same-day registration (condemned by New Jersey Gov. Chris Christie as a “trick”) and early and weekend voting, procedures used most by minorities, black Americans in particular. Nor does it explain an incredible effort just uncovered by Al Jazeera America that could shift the direction of the midterm elections. Given the tight races in Georgia and other battleground states, even a small number of false positives could turn the tide of an election, giving a strong advantage to Republican candidates for statewide and congressional offices. Yes, voting officials have to prune the rolls of deceased or inactive voters. The question is whether they’re taking the narrowest route and trying to avoid mistakes. They aren’t; compared with other voter lists, Crosscheck is incredibly broad with a strong bias toward removing people from the rolls. And the means for verifying voter identity—sending postcards to addresses on file—puts the burden of proof on individual voters and is almost designed to take people off the rolls; with false positives and duplicate names, there’s no guarantee that anyone gets their verification card, to say nothing of voters who have moved or don’t have a permanent address. Whether Republican officials are trying to nudge the electorate in the GOP’s favor is almost beside the point—since, intentions aside, that’s what’s happened. And when you take this out of its isolation chamber and put it in context—a world where Republicans want voter identification and reduced early voting and stiffer registration laws—it looks like a pattern of deliberate suppression, where some officials prune voter rolls with lists of minorities while others make it harder to vote altogether. This news comes just a day after the verdict in Georgia, where a state judge denied a petition from the New Georgia Project—a group that spearheaded registration drives across the state—to process 40,000 missing registration forms, striking a blow to voter mobilization efforts in the state. Last month, after it submitted 80,000 forms, Georgia Secretary of State Brian Kemp accused the group of fraud and opened an investigation into its voter drives. Soon after, thousands of forms went missing, prompting this lawsuit. Again, it’s the pattern that makes this suspect; the consistent effort from GOP officials, lawmakers, and judges to make voting more difficult, or facilitate efforts in that direction. Conservatives across the country are working to weaken voting laws and put new barriers to the ballot box. And in every case, Democratic constituencies are those most affected. Which is why it’s hard to take pro-ID arguments—like Rich Lowry’s—in good faith. Liberal and Democratic claims of voter suppression aren’t just about voter identification, they’re about the package of policies and techniques that burden voters and shrink the electorate in the process. Indeed, it’s worse than this. Voter ID advocates insist that their reasonable moves are intended to protect the integrity of the process and the sanctity of the vote, but the reality is that their policies have created confusion and chaos for hundreds of thousands of voters. Put another way, there’s not a serious Republican effort to expand the electorate and bring new people into the process. But there is a major one to do the opposite. And it hasn’t popped up in response to threats to the sanctity of the vote—even conservatives are beginning to acknowledge there isn’t much voter fraud—it’s emerged in a world where electorates are increasingly filled with people who don’t support Republicans. It’s brazen, it’s indefensible, and it needs to end.